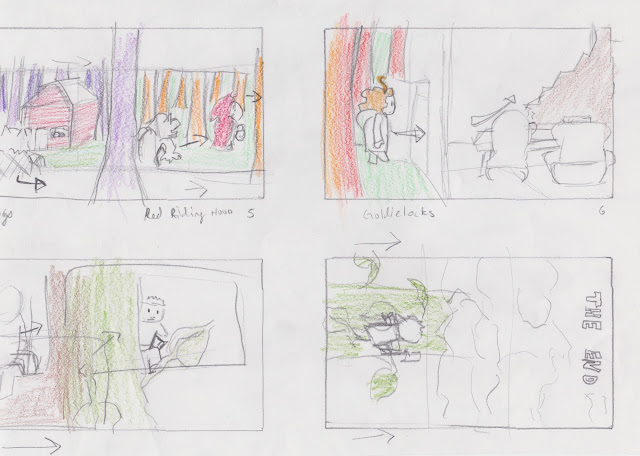 For my project proposal, I was thinking a stop motion paper animation. Done the way the first South Parks were done. I've wanted to do a paper stop-motion animation for a long while now, and I finally came up with a concept/story. 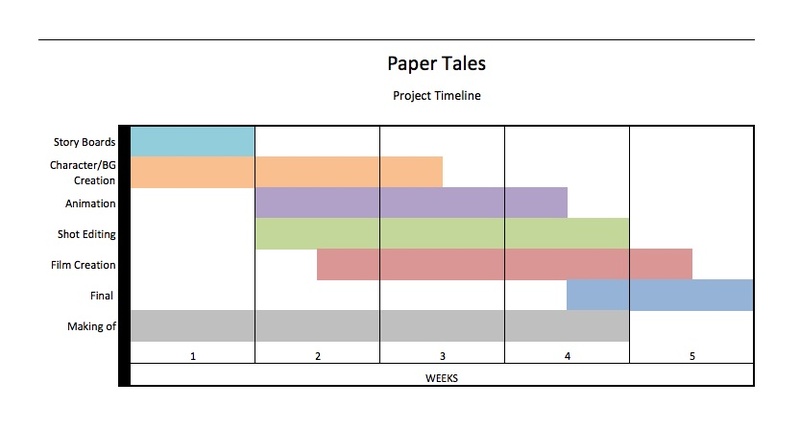 I want to use 6 different fairy-tales or folktales transitioning into each other. I was thinking animation tricks could be used to transition between them. Using obvious symbols like, red riding's hood to tell what story is being shown. 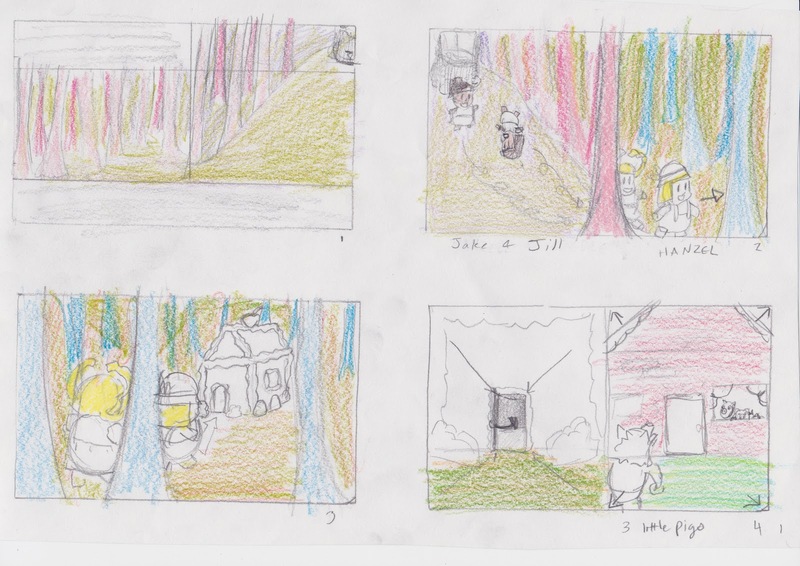 Here are some simplified storyboards for the project. 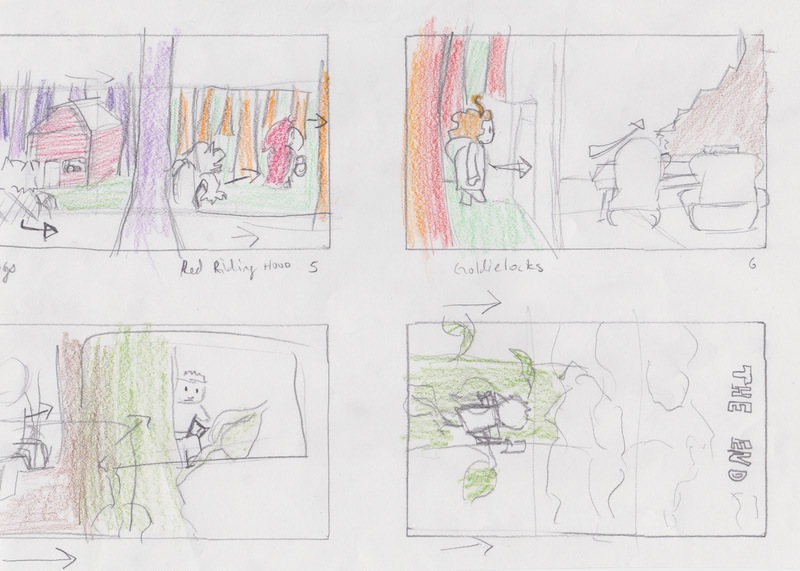 I think their should be a few more storyboards to give the project more life, but I just wanted to get the idea across. Please excuse the poor coloring, I just wanted to demonstrate how I wanted to separate the stories with changing the tree colors. As you can see very rough thumbnails, and I want to explain on each story, give more depth to each story. For the proposal, I just wanted to give everyone a feel for the design of the piece and how the stories would transition to each other. 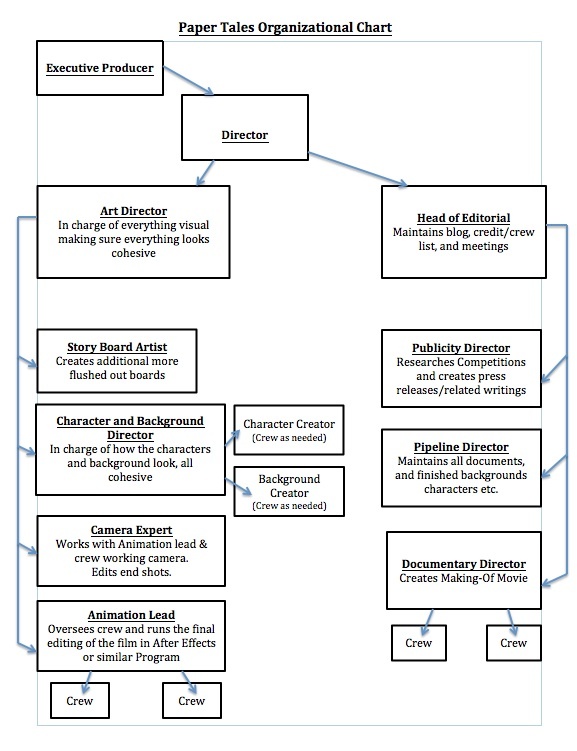 So everyone can understand the jobs needed for this piece, and in my head this would all be done on paper so keep that in mind. We have 5 weeks to complete this project, so here is a timeline to keep us on track! As a side note, I just wanted to add that I own a Cricut, so this means creating the background will not be so hard. we may be able to have the machine cut out the shapes, if the cartridges I have will work with the design. 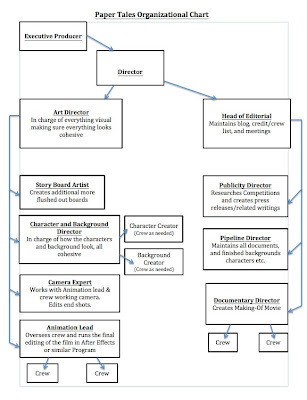 I like this idea, but what I really appreciate is that you have it organized in a way that makes it easy to see how the production would work. I have worked with paper cutout animation before. It can be difficult at times, but it is also lots of fun. I'm in love with fairy tales so this drew me in immediately. Your organization of the idea is easy to read and realistic. I know you mentioned your Cricut for backgrounds but another alternative is combining stop motion with 2-D. After affectd, toon boom, flash, and even photoshop have good layering options.2-D background with cutout animations could potentially make the entire stop motion easier to animate because backgrounds are easier to move digitally than on paper. I never thought of including 2D, that would make things easier! and appeal to a wider range of students wanting to work on it. Great idea!